This is going to be a image heavy and text light post. We are getting into the final days of packing and things are a little hectic. The previous tenants were't out of the place in time yesterday so I am going to get the keys today just in time to get our internet installed. Also my grandma went into the hospital on Friday and she wasn't doing so well yesterday morning, but she has stabilized now so we are hoping things will improve. Everything always seems to happen all at once all the time. hopefully once the move is over everything will settle down a bit. I made this shirt as a sample for work. 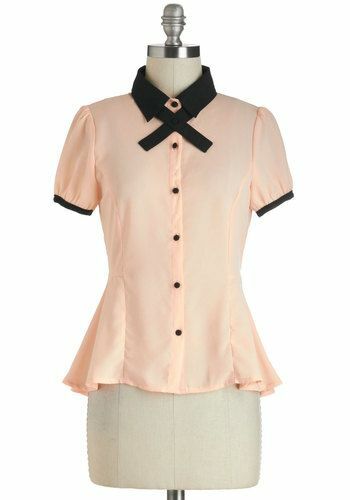 I saw the shirt below on ModCloth a while ago and fell in love. I actually was going to purchase it when it went on sale, but they were sold out in my size! The next week the new McCall's pattern book came out and this shirt was one of the newly added patterns! I asked to make a sample and my boss said yes which was awesome because she can be a bit picky about what samples can be made with what fabric. It was meant to be It had to hang up in the store for a month after I made it so I just got to wear it this weekend (after washing it thanks to dust and such). I am really pleased with how it turned out, and I love that the neck tie can be worn with other shirts. This post turned out longer than expected. Now for your viewing pleasure enjoy some pictures of Luna frolicking in the snow for the first time! naw bunny in the snow! Also, that shirt is so awesome!